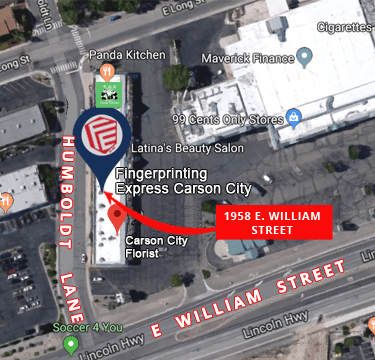 Q: Where is Fingerprinting Express located? 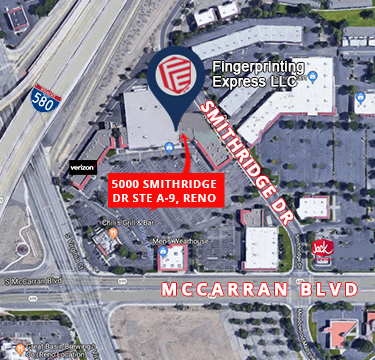 Reno location: 5000 Smithridge Dr Suite A-9, Reno, Nevada, 89502 located on S. Virginia and McCarran Blvd between Toys-R-Us and Verizon. Location: 1958 E. William Street, Carson City, NV 89701 located in Plaza 50 next to the Florist near Dunkin Donuts. 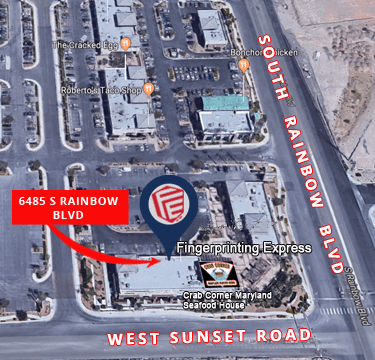 South West Las Vegas location: 6485 S Rainbow Blvd #103, Las Vegas, NV 89118 located on the corner of Sunset and Rainbow, near the 215. Central Las Vegas location: 1350 E. Flamingo Rd Ste 11, Las Vegas, NV 89119 located on the corner of E. Flamingo and Maryland Pkwy, in the Mission Center Plaza near Albertson’s, CVS and TJ MAXX. 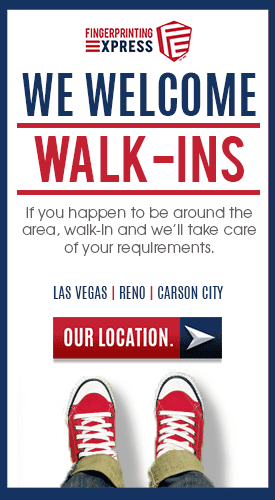 A: We also take walk-ins! No appointment necessary. You may book an appointment for our services by clicking on the ‘Schedule An Appointment’ box. Walk-ins will be served on a first come first serve basis. On average, our customers are in and out of our stores in minutes. We serve our customers in order of appointment first and completed paperwork turn in at the front desk. Q: Do you close for lunch? What are your business hours? A: NO, WE DO NOT CLOSE FOR LUNCH! A: Fingerprints that are electronically transmitted to DPS & FBI generally take 5-30* days for results. FBI Express background check results are available within 24 hours of being fingerprinted. If the fingerprint cards are manually sent into DPS & FBI it will take 2-6* months to receive the results. *Some divisions and/or boards may take longer to process the results and applications. Please check with the agency for process times. A: If the fingerprint background check is being requested by an employer or an industry i.e. Contractor’s Board, Nursing Board, Real Estate, Gaming etc… they will get the results directly. If an individual person requests the fingerprint background check on themselves the requester will get the results. Q: How far back does the fingerprint background check go? A: The fingerprint background checks go back to age 18. A: Yes! 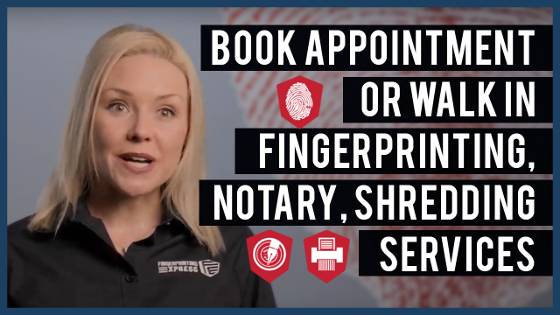 Fingerprinting Express can come on location to provide mobile services in Northern Nevada… We only need access to a power outlet in order to fingerprint on location at your place of business or home. We request you set up your appointment for Mobile fingerprint services at least two weeks in advance when possible. To make an appointment in advance please call Reno 775-322-5587 Carson City 775-222-0061 SW Las Vegas 702-489-7994 or E Flamingo 702-823-3155. Q: When do you have a Notary Public available? A: Our Public Notaries are always on-site and available to notarize documents during our normal business hours. If you require Notary Public service after normal business hours, please call during business hours to book your after-hours appointment. We also Notarize I-9 forms. A: Livescan Fingerprinting is newer technology and type of fingerprint collection method that allows us to capture inkless fingerprints. 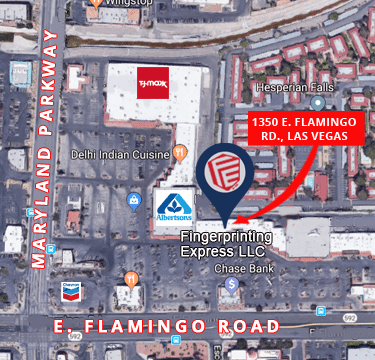 Fingerprinting Express has the ability to print Livescan fingerprint cards and we can also send the fingerprints electronically to the State of Nevada and the FBI. A: Livesan is the method and technology to submit fingerprints without ink. Electronic submission of fingerprints is the method the fingerprints and personal data are delivered to the State and the FBI when the fingerprints are taken via Livescan Fingerprint Machines. Ink fingerprinting is the old ink method to capture fingerprints on fingerprint cards, the ink method may not be sent to the State and FBI via electronic or email methods… The ink cards have to be mailed in which will take longer for processing. Fingerprinting Express offers all fingerprint methods including ink, inkless, Livescan, manual and electronic submission methods. A: Chances are the answer is YES, you will need to be fingerprinted again. If you are being fingerprinted for a different industry or reason the answer is “YES”. The only circumstance you will not need to be fingerprinted again is if you are in the exact same industry, requiring the same NRS (lawful) reason why you have to be fingerprinted, you have successfully processed a fingerprint background check, in Nevada, within the last six (6) months. If this applies to you, you may fill out a “Department of Public Safety Duplicate Response Form”, and request the State of Nevada share your results with the new company. Please be advised the State may not share these results and may request you to get re-fingerprinted… Example: if you were fingerprinted for Real Estate and need to have fingerprints done for Contractors Board you will need to be re-fingerprinted. If you were fingerprinted to work in a group home and are moving employment to the same exact type of group home, and you were Livescan fingerprinted in the last 6 months, you may qualify to use the Duplicate Response Form. A: Yes! We can fingerprint teachers and parent volunteers! We offer teachers and volunteers discounts on our fees- as a thank you for the good work! We offer one stop shopping for Teachers. You can get fingerprinted and get your Department of Education Application Notarized all at one place: Fingerprinting Express! A: You need to contact your regional coordinator, hiring manager or state fingerprint department to obtain those numbers. It will start with an NV if located in Nevada. Q: What major Holidays are you closed? Mobile Fingerprinting and Mobile Notary Public services are also available by appointment. We will fingerprint you one more time, at no additional cost… as long as you have your original sales receipt. We have over 50 years of combined Fingerprinting Experience and we guarantee our work. a nice waiting lobby and generally our clients are in and out within 15-20 minutes. Licensed, Bonded, Certified, Insured and Preferred! been provided. We reserve the right to refuse service to anyone.